For hundreds of years Christians have been asking: “When will the rapture happen?” We expect it to happen soon because our leaders tell us that we are living in the last days before the second coming of Jesus Christ. Christians are pretty gullible, but after hundreds of years of failed prophecies, some of us have concluded that there is something wrong with our end times theology. Over the years, many great leaders have incorrectly told their followers that Jesus’ return was imminent. Martin Luther was wrong, Jonathan Edwards was wrong, John Nelson Darby was wrong. Dwight L. Moody was wrong and for sixty years Billy Graham has been wrong, too. It is obvious that either these gentlemen have a faulty understanding of Scripture, or the Bible is wrong. In this paper, I will show you that the problem is with our understanding of the Bible. We’ve made a big fat blunder! This passage says: “We shall not all sleep.” “Sleep” is a euphemism for “die.” And nobody wants to die, so seizing upon this verse, many Christians expect that they will escape death by being raptured. But the centuries go by and these true believers keep dying… Luther, Edwards, Darby, and Moody are all dead and soon Dr. Graham will be dead too. And they haven’t been raptured. So let’s take a closer look at the passage… we will answer the question: “When will the rapture happen?” And you probably will not like the answer! Look at the context: Paul wrote to Christians who were living in the city of Corinth 2,000 years ago. He told them (not us) that some of them (not us) would not die, that they would be raptured. So either they were raptured or Paul was a false prophet. And here is the bad news: if Paul spoke the truth and they were raptured, then the rapture happened almost 2,000 years ago and you have been left behind! “No! No! No! If the rapture happened we would know about it.” That is probably what you say, but maybe the rapture involved a small number of people who were in hiding… Do you know that following the great fire of Rome, in AD 64, Nero blamed the Christians for the fire. He then tried to kill every Christian in the empire. Roman historian Tacitus reports that a “vast multitude” were killed. And Josephus describes in gory detail the diabolical ways in which they were killed. Jesus predicted this terrible tribulation and said that many would abandon the faith (Matt. 24:9-10). So maybe the few Christians that were left were in hiding and their disappearance in the rapture would not have been noticed. An argument from silence supports the idea that the rapture has already happened. Do you know that we have a great deal of written material was produced by Christians before AD 70 and we have a great deal of material that was produced after AD 100, but nothing from the interim? Why did the writing stop after 70 AD? Nobody wrote bitterly complaining that the rapture hadn’t happened, and nobody wrote describing the spectacular experience of being raptured… maybe that’s because raptured people don’t write books. 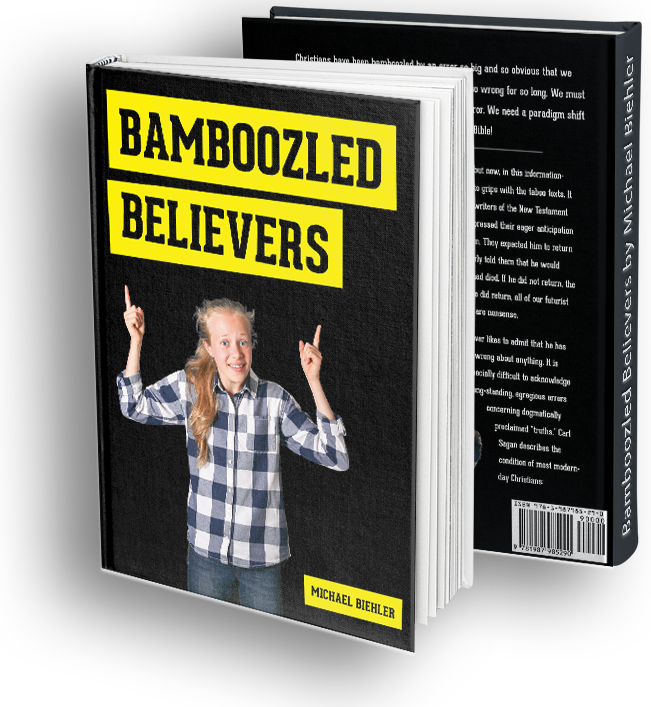 I know that I am hitting you with some big ideas… there is so much more information that I would like to give you, so please read Bamboozled Believersand consider joining our Meat Not Milk Bible study. We’ll really get into the “meat” of God’s word. If it is God’s will, perhaps we can start a revival! The Book of Revelation was written before AD 70. Plenty of internal evidence supports this assertion. See: Before Jerusalem Fell: the Dating of Revelation by Ken L. Gentry. * All the prices above are in US Dollars.